Krazy & Ignatz was first published in 2001 by Stinging Monkey Publications based in Edmonton, Alberta. The editor and publisher is historian and archivist Greg Fink who assembled the book from scans provided by the San Francisco Academy of Comic Arts. 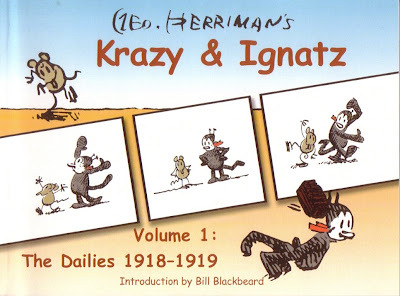 Krazy & Ignatz is an attractive collection of one year of gently humorous dailies and sports a nifty Introduction by Bill Blackbeard. The re-issuing of the Kat dailies has been taken over by Fantagraphics but Greg has plans for issuing reprints of evergreen favourite comic strips Barnaby and King Aroo. I look forward to that! Krazy & Ignatz is still in print and on sale through Amazon.